Being a creative person in today`s internet driven world is probably the hardest thing to be. And it is not because creativity in the form of artistic endeavors such as music, photography, painting, and writing, is a very time-consuming process. But, it is because once their creative work goes there on the internet, they no longer remain the sole proprietor of their artistic works. That, undoubtedly, is the hardest thing these creative people go through because of the internet. Well, can that be the end of it? I mean the blockchain development services have shown the promises of putting an end to the unauthorized reproduction of creative works online. It promises to protect the copyright infringement and violation committed on the internet. Though the blockchain technology came into existence primarily for the creation and distribution of new kind of currency, which is digital, i.e. Bitcoin. But it seems on track to revolutionize the way internet works and how people interact, access and transact on the internet. One such revolutionary scope of blockchain development services is in the Intellectual Property domain. No proper digital registry for keeping the record of such things as trademarks. No secure catalog for safeguarding the creative works of authors and musicians. These emerge as the primary reasons why infringement takes place. Because of such encroachment, they not only lose monetarily but also get ousted from the authority of their creations. 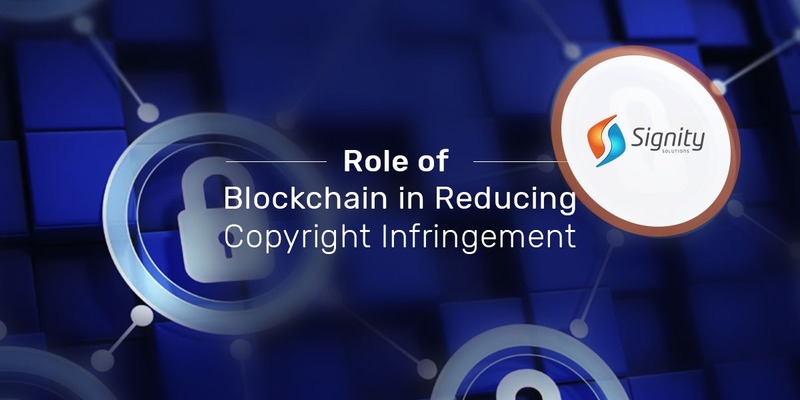 With the rise of blockchain technology companies, hopes are high that copyright infringement could soon be the thing of the past. It promises air-tight protection of copyrights. Any transaction completed via the network of blockchain remains there permanently, the record of which cannot be edited or removed. The blockchain transaction record would, however, remain accessible for the third party. And this is though strictly subjected to the license and ownership of that very intellectual property (IP). The IP would become more secure with the blockchain app development. Because it keeps the permanent and impenetrable record of transactions taking place. Furthermore, it stores data of transaction on a centralized as well as decentralized (meaning public) register. Any creative person such as an author can, record and register his/her ownership, as the legitimate copyright holder of the creative work on not only the centralized network of blockchain but on its decentralized network as well. This makes it possible for authors to keep track of their material on the internet. It allows authors to create a license agreement with other institutions and individuals who may want to use their material. It records everything right from work is registered on its network. On the internet, right now, there are no provisions for owners of copyrights to some way limit the use of their material online. But with the advent of the blockchain, this limitation is now thing of the past. Because it gives them a detailed record of the use their work has accrued over the years. It lets them know who, where and when is using your material. Going beyond the bitcoin, the impact of the blockchain application development groundbreaking technology has begun to show up as many music industry owners have already partnered with blockchain developers to create for them a highly secure and copyright protection proof system so that they could put an end to the violations and infringement of the copyrights. The music creators and producers seem enthusiastic about blockchain technology solutions. Because they believe that it could at last stop unauthorized distribution of the music. They are even hopeful that on complete development of such technology, they would, at last, get the royalty they deserve. So how would blockchain reduce the copyright infringement? It would do so by securing the Copyright, help authors strike a deal via its Smart Contracts feature, help everyone associated with publishing industry receive timely payments via cryptocurrency development services, and above all, it would do so by ensuring better Privacy between the owner of the material and its consumer or one who would want to buy it. Rest would depend on how the technology emerges and develops. And furthermore on how would Intellectual Property sector respond and embrace the new blockchain technology solutions. Hire the best Blockchain Development Company! At Signity Solutions, we are the best blockchain developer in India having years of experience in providing blockchain development services besides being an established name in providing mobility solutions in India and abroad. Consider outsourcing to India and hire blockchain developer for your company. Feel free to reach us here, and we will revert at the earliest.